Our BEACH HOUSE at 806 Ocean Boulevard is directly on the ocean. You can hear the waves from the front rooms. We have just finished repainting inside and out. The great room and bedrooms have been redecorated. This is a BEACH HOUSE for large families. The great room is two levels with windows above to give you a BEACH feeling even while you are inside. The house is very open with lots of light. There is lots of space for even large groups to be together without any feeling of being crowded. The location is ideal. You are 2 blocks of easy beach walking to food, drinks, ice cream , shopping and video games. However, you are far enough away from any public parking that the beach in front of the house is limited to occupants of homes and not day tourists. It is never crowded. There is a king bed in the master bedroom facing the ocean and a queen in the opposite ocean front bedroom. There is a queen in the street side bedroom with a bathroom between the two bedrooms. Upstairs there are two bedrooms on each side with a connecting loft and bathrooms between the bedrooms on each side. On the ocean front there is a king on one side and a king with a twin daybed for children on the other. On the street side there is a bedroom with 3 twin beds and a bedroom with 2 bunk beds and an extra twin. There is a pull out sofa in the connecting loft. The lower deck is covered with protection from sun and rain. This deck has two sets of table and chairs for dining or cocktails outside. There are two open decks off the upstairs ocean front bedrooms for private sunbathing. Keep in mind, during off off season (January, February, March) you can rent this property for $950 a night and enjoy the ocean! Your party does not need to fill every bedroom to enjoy this property! Think 3 bedrooms instead of 7 and it's a bargain compared to staying downtown! Enjoy! I live downtown in Historic Charleston.We designed and built this beach house to enjoy the ocean whether you are inside or on the sand. We bought this lot to build on so we were close enough to walk up the beach to eat, shop or play games. But we are far enough away to avoid the crowds where there is public parking. 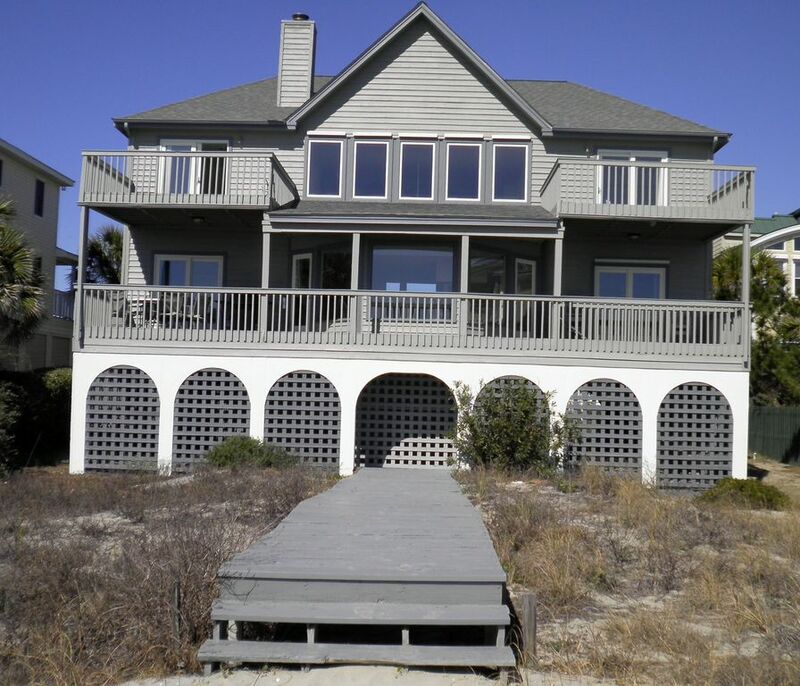 Perfect house to accommodate all guests, beautiful ocean views and great location! Gus was also very responsive and available! We thoroughly enjoyed staying at this house. The location is second to none. The house certainly has some wear on it but no more than you would expect from a frequently used beach house. The porch was a great place to hand out and we also spent some time at the beach. The windjammer was a 5 minute walk. The open layout made it easy for all of us to hang out together. Gus was easy to work with and I would definitely stay here again. We had a great stay at the house. Owner was very responsive to communications. Location is perfect - right on the beach and a short walk to the Windjammer. We enjoyed the Beach and View.. We had our Swiss family visiting and did not have enough towels, dishes and house was not clean. The upstairs bedroom balcony was boarded up so they could not sit on their balcony etc. The TV did not have a DVD to watch movie etc. Bathroom needed mats on the floor, easily to slip. Water stains on the ceilings etc. This property has a great location on the beach. The house itself has a good set up. Everyone involved was very helpful. The house it self had a few minor repairs that could be fixed but this had no effect on our stay. Upstairs didn't have great A/C circulation but that was the only complaint. I would rent this house again. Thanks Maclain you can come back anytime the salt water just eats those A/c units up have to replace every five to six years.